Finalist on Televisions "Fore Inventors Only." 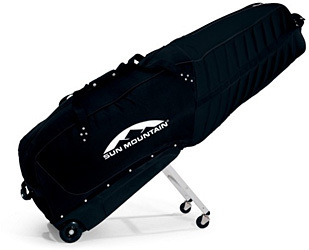 • Internal dimensions: 54" X 16" X 14"
This is the golf club travel bag golfers have been waiting for. I have used the Club Glove rolling travel bag for years. It took good care of my clubs but was a pain to roll around since you had to bear a considerable portion of the weight of the bag. The Sun Mountain Club Glider makes it trivial. Bravo Sun Mountain.